Magneto and Professor X. Superman and Lex Luthor. Victor Vale and Eli Ever. Sydney Clarke once had Serena-beloved sister, betrayed enemy, powerful ally. But now she's alone, except for her thrice-dead dog, Dol. And then there's Victor, who thinks Sydney doesn't know about his most recent act of vengeance. Victor himself is under the radar these days-being buried and re-animated can strike concern even if one has superhuman powers. But despite his own worries, his anger remains. And Eli Ever still has yet to pay for the evil he has done. I have been so excited for this book ever since I finished the last page of Villains #1, Vicious (read my review of that HERE). But the problem with having to wait for something is that you build an image in your mind of what you are going to get and invariably the author fails to hit your stupidly conceived notions. Not this time. V.E. Schwab has not only cleared my bar she has set the standard even higher for any third instalment. Reading always used to be fun when I was a child, whether that was time with my mother as a very young semi-illiterate dyslexia sufferer, or on my own as a slightly older still semi-illiterate, stories always found a way in, to treat me to worlds I couldn’t have described or thought of on my own. As an adult, although my reading and writing challenges were almost behind me (ask my editor and she will admit how much of her hard work goes in to form even a basic sentence under my name) I didn’t get the same sense of adventure, of fulfilment as I once had. Grown up books sucked, if I’m honest, and it took many years to start enjoying the more formal way that a story for an adult seems to be put together. I discovered Titan Books a few years ago and, to be fair to them, the books I get all seem to bring the fun back to reading, they seem to take a chance on authors who just seem to get me and what I want from a book, which is great but that childlike fascination with reading still wasn’t there. V.E. Schwab, I discovered, was an author that wrote books for older children and young adults and although Vicious was most definitely a grown ups book there was an air of childlike wonder to the world she had created. Vicious worked for me not just because of the unique spin on superheroes but because every word on every page gave me a sense a fulfilment I had been missing since childhood. 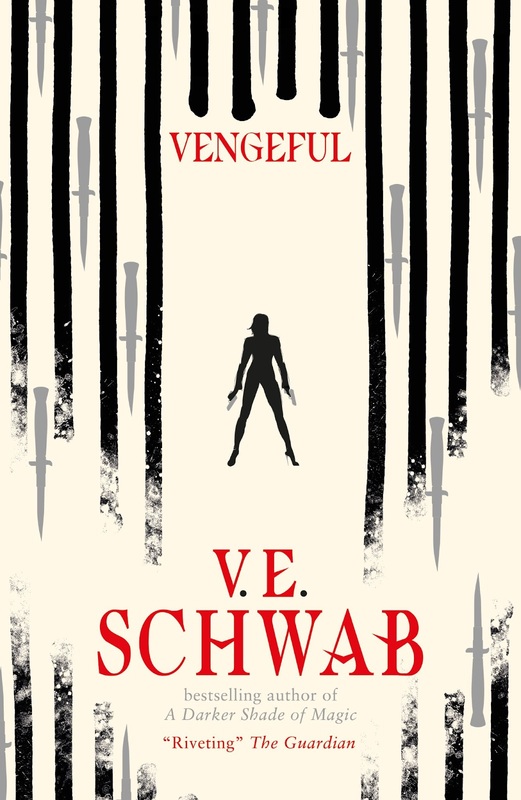 With Vengeful, my mind had created an expectation of more of same but somehow bigger, more brash, and Schwab delivers, oh my word, how she delivers. Each character is so well thought through, with each back-story rich in detail and most importantly relevant. The book itself ramps up the violence, the ego, and the tension but without ever losing that sense of enjoyment I get reading it. Its layout is fantastically put together and it’s a credit to Schwab that, despite jumping to a different point in time almost every other page, I never once got lost, I never once got confused. I just lapped up detail after detail, fact after fact, character after character until I was at peak frenzy just before the climax of the story. That is an incredible skill that I really admire in writers, that ability to get you right where they want you just in time to blow your mind and V.E. Schwab nails this element of storytelling like few others can. Vengeful was full of characters that you had to invest in, they jumped off the page demanding your attention whether you wanted them to or not, whether the villain of the piece or not, every person mentioned in Vengeful is there for a reason and the pay off is worth the wait, ending perfectly, leaving you wanting more with the door possibly open to other stories within this extraordinary world created. By far my book of the year, probably my book of the last few years, and the most fun I have had reading since childhood.